The L.R. 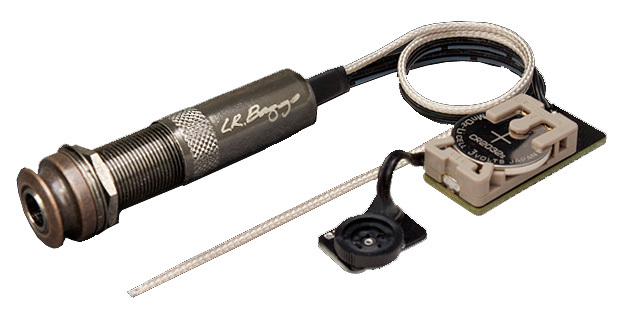 Baggs FIVE.O ukulele pickup system is small and light-weight, and best of all, specifically tuned to track the uke's natural dynamics and its unmistakably unique voice. The FIVE.O Ukulele Pickup System combines a custom version of LR Baggs' award winning Element undersaddle pickup with a miniature endpin preamp, a soundhole mounted volume control and a standard 1/4" endpin jack and is powered by a standard 3 Volt coin cell battery (included). The entire system weighs less than one 9 Volt battery and tucks away neatly inside the small instrument for a non-invasive installation. The FIVE.O Ukulele Pickup System works on all sizes of ukulele, including tenor and baritone ukes. The coaxial Element undersaddle pickup is not string position dependent and can be used on both 3/32" and 1/8" saddle slots. The pure, all-discrete electronics are voiced for the most accurate frequency response you have ever heard, so plug into the FIVE.O and enjoy the performance you have been waiting for.